Disclaimer: Information shared here is just for educational purpose. 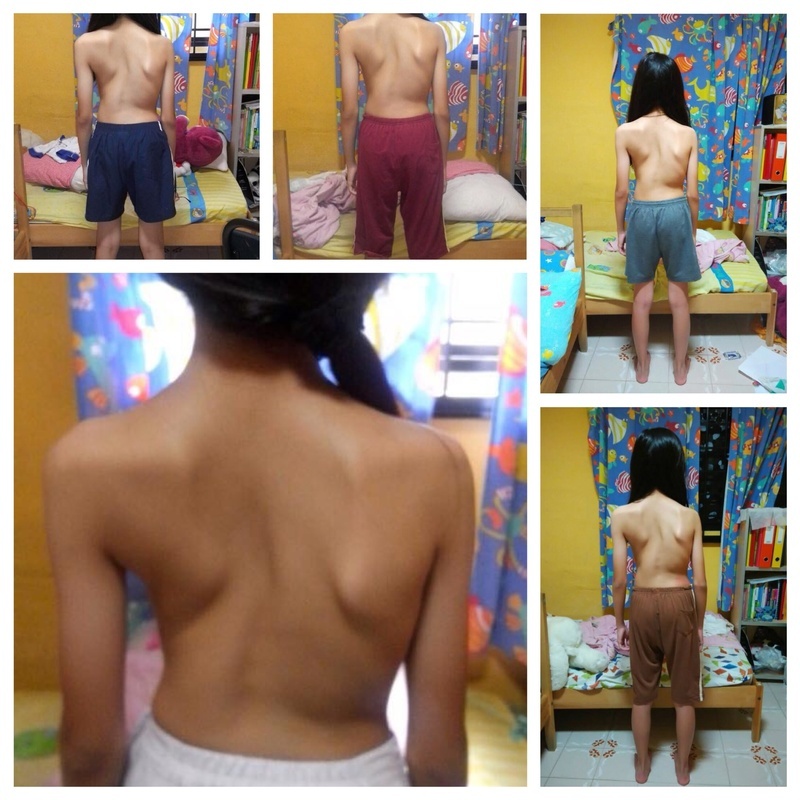 'Student' going through personalised yoga-asana program for her Scoliosis condition. Her name is Ms E and her first visit to the studio was on 2015 Jan 8th. During initial conversations, the mother had shared that she has become 'desperate' after spending almost 2 (years) looking for a possible 'rememdial solution' to Ms E's spine condition. In fact, Ms E had been on a treatment program for the last 9 months leading to Dec 2014. Unfortunately, the condition for Ms E has worsen from 33 degrees to 53 degrees. In addition she was 'under pressure' from friends, families and associates to send Ms E for operation (from our conversations). I thought I would like to share her progress here. In case there are mothers (or parents) out there who are currently 'desperately' looking for a possible improvement program for their children. Bottom Left: Photo taken the day (2015 Jan 7th) before her 1st session @ Balancing Rocks studio. "The 2017 total is all the more remarkable when you consider that capital costs for the leading technology -– solar -– continue to fall sharply," said BNEF chief executive Jon Moore. Solar investment came in at $160.8 billion in 2017, a rise of 18 percent despite per megawatt capital costs falling by around a quarter, with China accounting for around half the overall total at $86.5 billion -- up 24 percent, the study said. "China installed about 20 GW more solar capacity in 2017 than we forecast," said Justin Wu, BNEF head of the Asia-Pacific region, as the Chinese notably showed off the world's first photovoltaic expressway. Well behind China, the United States landed investments of $56.9 billion -- a rise even so of 1.0 percent despite an unfavourable political climate with President Donald Trump sceptical of climate change and withdrawing his country from the Paris climate agreement. The study highlighted what it termed Washington's "less friendly tone towards renewables." Do you want something super new? Look at this link. Only there the choice of young girls for every unique guy and completely free! They are responsible slaves, they will do anything you command ! I must voice my passion for your generosity in support of those individuals that really want assistance with this particular area of interest. Your real dedication to getting the solution all-around turned out to be exceptionally functional and has in every case helped associates like me to arrive at their objectives. The invaluable guidelines implies so much to me and even more to my colleagues. Thanks a ton; from all of us.